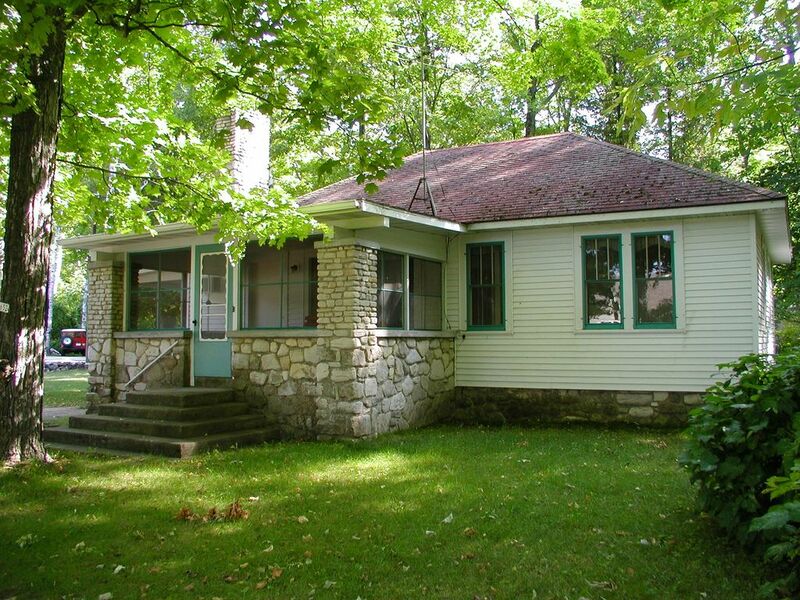 Located in the Point Beach area, the cottage is surrounded by woods and in the vicinity of private summer homes. It's across the road from the bay just outside of the harbor of Egg Harbor. This traditional one story cottage has three bedrooms, two bathrooms, dining room, living room, fireplace, kitchen and screened porch. You can walk to the Alpine 36 hole golf course, 1/4 mile away or the Alpine Resort with restaurant and bar, 3/4 mile from this house. This quiet area with very little traffic is great for walks. The Alpine Beach and the Egg Harbor Beach are less than one mile away. I was born and raised in Egg Harbor, Door County, Wisconsin. I attended grade school in Egg Harbor and Gibraltar H.S. in Fish Creek, and I am a UW - Madison graduate. Our family business is Alpine Resort and Golf Course in Egg Harbor. I have two sons and live in Sturgeon Bay. We have a golden retriever puppy that is very active and playful and he loves to swim. The Birchmont cottage has been in our family from the beginning. It's close to Alpine Resort and Golf and close to all the great things Egg Harbor (and Door County) has to offer. It's only available for vacations in the spring, summer and fall. My family is very protective of this house and keep it very clean and well maintained. This house is a cute "cottage" located in an area of private summer homes with lots of trees and walking trails and it's right across the road from the water with public access to the water. I'ts just outside of the harbor of Egg Harbor in an area called "Point Beach" where the summer neighbors are friendly and fun. It's walking distance to Alpine's 36-hole golf course and just a short walk to the Alpine beach and Egg Harbor beaches. There is a house located between Birchmont and the water and you are able to walk across the road to the water. Murphy Park swimming beach is in the other direction about two miles from Birchmont. The house is located in a very quiet wooded area located around the point of land that forms Egg Harbor. The area called Point Beach has summer homes that are occupied seasonally. Birchmont is located within the rural area of the quaint village of Egg Harbor. Electric heat is available for cooler temps. Linens are provided and may be exchanged during your stay by bringing them to Alpine Resort, 3/4 mile from the house. There is parking available for several vehicles in the driveway. Towels are provided and may be exchanged during your stay by bringing them to Alpine Resort, 3/4 mile from the house. The living room has a full-length and upholstered chairs and a fireplace. Full size frig is located in the kitchen. The kitchen has all the items that you would need to have three meals per day. There is a dining room table with six chairs. Direct TV is available with approximately 18 networks both local stations and other stations. Direct TV provides approximately 18 networks. Books may be borrowed from the Alpine Resort, 3/4 mile from the house. The game room at Alpine Resort is available for your use and offers two pool tables, two ping pong tables and video games. There are two pool tables at Alpine Resort and can be used from 9 am to 11 pm daily. One is a free table and one is a pay table. You are welcome to borrow movies from the Alpine Resort. There are kayaks and stand-up paddleboards for rent at the Egg Harbor beach all summer and this is located about 3/4 mile from the house. Bicycles are available for your use at Alpine Resort from early morning until sunset. Rowboats are available for your use at Alpine Resort. There is a screened porch attached to the house with outdoor seating. There are two tennis courts with equipment available for your use at Alpine Resort. Alpine Golf Course is located .25 miles from the house. Multiple day guest passes are available for discounted rates. The outdoor heated pool at Alpine Resort is available for your use from 9 am to 9 pm late May through mid September. The house is located in a quiet area of summer homes in the Point Beach neighborhood in Egg Harbor. It's large enough to accommodate family members of up to nine people. Central Egg Harbor has a great market called Main Street Market and you can purchase most items that you might need including food, Door County products and alcohol. Harbor Hardware is located on the north end of Egg Harbor and has a large inventory of items. There are free concerts in Egg Harbor in the summer on Thursday afternoons at Harborview Park and on Sunday evenings at the Peg Egan Performing Arts Center. There are regular concerts in the summer at Birch Creek Music Center about three miles east of Egg Harbor. You are welcome to attend the nightly activities at the nearby Alpine Resort in July and August. These include live music on Mondays, Wednesdays, Fridays and Saturdays as well as a hayride on Tuesdays (weather permitting), games on Thursdays and a movie on Sundays. Loved the location, near the bay. We stayed there in October and the trees were absolutely beautiful. The reason for the 3 stars, the website said wifi, but you only get wifi at the main resort, there isn't any in the cottage. Be careful of the faucets in the shower, turn the hot off first before the cold, my friend turned the cold off first and almost burned her skin. Paid $10 for firewood, but the wood was wet and didn't burn, ran around outside to find firewood alongside the road. The cottage is on a nice property and has the potential to be a nice place to stay. Just a short walk to the water is something we always look forward to. The beds are very uncomfortable and there are some home repairs that need to be addressed. The cottage is part of the Alpine resort which also needs some updating. The staff were very nice. The Birchmont is a very nice northern Wisconsin cottage located just south of Egg Harbor and just across the road from the bay. We enjoyed our time there and felt that the cost matched our experience. Our group was two couples and two 1 year old kids, and we felt there was enough room for all of us. The location also provided a quiet and beautiful backdrop that worked perfectly for our young children and their early bedtimes! The Door County peninsula, and Egg Harbor in particular, is a popular tourist area with an array of shops, restaurants, artisan cheeses, art galleries, parks, marina, home decor shops, Wood Orchard Farm Market, Shipwrecked Brewery, and hiking and walking trails within one mile. Free live music at Peg Egan PAC and Concerts in the Egg Harbor Park - 1 mile. Door Peninsula Winery and Door County Coffee - 10 minutes. Orchard Country Winery - 5 miles. Birch Creek Music Center - 4.5 miles. Peninsula State Park - 5 miles. 10 lighthouses on the peninsula most within 45 minute drive. Discounted golf passes to Alpine Golf Course. Free tennis, bikes, rowboats, fishing poles at Alpine Resort. Whitefish Sand Dunes and Nature Center - 20 minute drive. Al Johnson's Swedish Restaurant - 20 minute drive. Washington Island Ferry - 45 minute drive. If the reservation is changed after arrival, you will be responsible for the original reservation dates. Please note there may be minimum stay requirements for the dates you request.